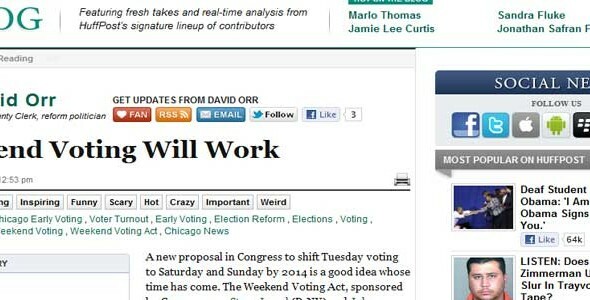 A new proposal in Congress to shift Tuesday voting to Saturday and Sunday by 2014 is a good idea whose time has come. The Weekend Voting Act, sponsored by Congressmen Steve Israel (D-NY) and John Larson (D-CT), deserves bipartisan support. Weekend voting will finally give busy Americans a chance to vote without squeezing another errand into their hectic work days. It may surprise most Americans to learn that we don’t vote as much as our counterparts around the world. Europeans, Canadians and South Americansall vote more than we do. Our election schedule contributes to this discrepancy — nearly every other democracy votes on a weekend or on a holiday. Voting on a Tuesday, a holdover from agricultural society, is an anachronism that keeps working people from the polls. Frankly, American voters need the weekend option more, not less, than workers elsewhere. Study after study shows that Americans work longer hours, with fewer vacations than Europeans, Canadians — even the Japanese. Of course, many states have long recognized this impediment and have tried to overcome it with a patchwork of solutions. Some instituted early voting to give voters more flexibility, hoping that a choice of days would be a cure for the nuisance of Tuesday elections. Unfortunately, early voting has its own shortcomings. The hours generally end at 5 p.m. on weekdays and are abbreviated on weekends. And the bigger problem with early voting is just that — it’s early. Not everyone chooses their candidates 10 days before an election, which is the last early voting Saturday available to workers who must punch a time clock. Our system has other drawbacks. We have restrictive voter registration policies, while other democracies automatically register their citizens when they turn 18. Our voters must register each time they move. Registration authorities differ from state to state, and county to county. And registration is not allowed on Election Day in most places, which conflicts with our on-demand culture. The good news is weekend voting is a reasonable, national reform to make voting easier. It provides uniformity. It gives more Americans the chance to vote and might allow savings in early voting. The naysayers are already complaining about the cost, but they are wrong. As the election authority for Cook County, the nation’s third largest jurisdiction, I know we can manage weekend voting and I am eager to explore the benefits. Instead of only relying on retired and unemployed poll workers, we can also recruit professionals and a new generation of civic-minded citizens who value voting as a patriotic duty and are eager to help. Weekend voting makes sense for working people and election workers alike. This is why it has been championed for years by public leaders from Jimmy Carter to John McCain. It’s time to pass a bill to vote when most people can do it. After all, isn’t voting what democracy is all about?